International Music Summit (IMS) is proud to announce the return of its summer camp educational program, IMS College – Malta, to the Mediterranean island for the third year running on 14-15 September. The programme offers the next generation of electronic music artists and professionals the tools and knowledge they need to build a career in the industry. Working in partnership with global trade body the Association For Electronic Music, leading music production institute Point Blank Music School and preeminent institute of contemporary music Berklee College Of Music, IMS College – Malta will provide a carefully curated schedule of seminars, workshops, discussions and interactive sessions, paired with night time parties throughout the weekend. Observing the need to support and develop the future of the electronic music industry, IMS has created a dedicated educational programme to help cultivate and inspire students, emerging artists and the next generation of business leaders who will push our genre forwards. 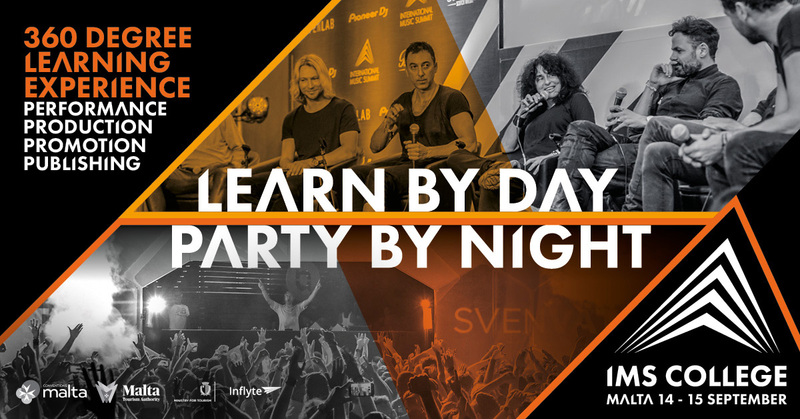 With the ethos of ‘Learn by day, party by night’, the summer camp is a two-day, intensive learning experience led by some of the world’s most renowned DJ talents and industry thought leaders. Keynote speaker Dubfire will join representatives from ACS, AEI Group, AFEM, Beatport, Black Rock Publishing, elrow, Help Musicians, Inflyte, Mixmag, Ultra and Warner with more speakers to be announced. Artists and industry leaders will give valuable insights on the four key educational pillars of IMS College – Performance, Production, Promotion & Publishing. By night and throughout the weekend delegates will be able to see special performances from world leading artists; Global party phenomenon elrow comes to Uno Village, featuring Iranian-American house and techno producer Dubfire, Grammy nominated duo Camelphat, elrow Residents plus local Maltese talent Carl Bee. Ibiza born and raised duo the Mambo Brothers will open the party proceedings with a rooftop sunset gig at the Sky Beach bar, plus fellow Ibicencan Manu Gonzalez at Playground.